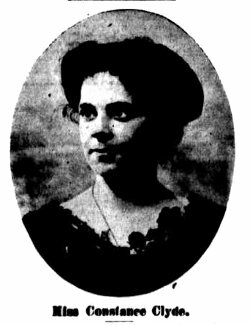 Constance Jane McAdam (1872-1951) was an author who wrote as 'Constance Clyde' and resided in Brisbane during the later years of her life. She spent a few weeks in the women’s prison at Boggo Road in 1935 after being convicted of ‘pretending to tell fortunes for payment’, but this was not her first time inside a prison cell. As a journalist living in London in the 1900s, she had participated in a major demonstration by Suffragettes outside the House of Commons, and was (deliberately) arrested for her troubles. She subsequently wrote two highly interesting newspaper articles on her experiences at the protest and inside prison, both of which are reproduced below. The struggle for equal voting rights in Britain had gone on for decades, mostly by peaceful means, but by the 1900s the activist women were getting frustrated and turned to direct action. Their first demonstration directly outside parliament took place on 22 March 1907 after a Private Member's Bill to give (some) women the vote was defeated. Prime Minister Henry Campbell-Bannerman voted in favour of the Bill, but he allowed his MPs a free vote. The subsequent failure sparked a large protest outside the House of Commons, which was defended by 500 policemen. There was a prolonged and sometimes violent face-off that resulted in the arrest of 75 of the women. ‘Through London with the Suffrage Procession. Royalty excepted, London has raised but one statue to a woman; that woman be it noted, was a fighter. Opposite Parliament House stands that stone embodiment - Boadicea in full career. Is it not, perhaps, both an emblem and a prophecy? In the streets that surround it there was fought two nights ago a woman's battle, purely physical, for the fight to vote; ladies struggle with policeman; constables in that hysteria to which this class of men are liable, hustled and arrested innocent people - who did not even know that a suffrage riot was in progress! 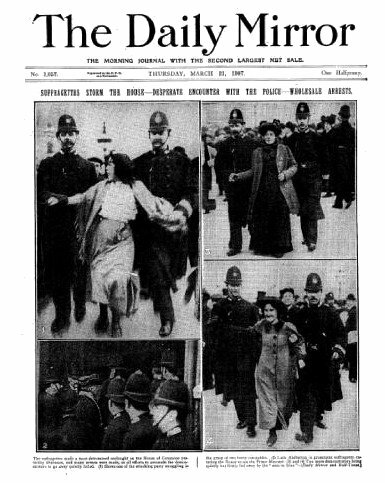 The papers have given but a mild account of the trampling and confusion that led to the arrest of fifty seven suffragettes on that historic evening, when some hundreds of women marched from Exeter-hall to present their petition to Parliament. The authorised procession that took place the Saturday previous, however, has its own interest, though - a strange omission nowadays - the proceedings did not close with a string of ladies going to gaol. It is the custom of the suffragettes to give an occasional peaceful demonstration in order to show that their violence is of malice prepense, and not innate. On such occasions there come forward the gentler spirits, who, not caring to share in the aggressive methods yet wish to evince their sympathy whenever they can. For without exaggeration, sympathy is the general sentiment of English womanhood towards these twentieth century Boadiceas. That so many of such sympathisers are well to do middle-class women is, perhaps, the best omen for future success. One is not astonished that Lady Frances Balfour, and Lady Strachay rode in the procession, or that the Countess of Carlisle's daughter walked shoulder to shoulder with mill girls carrying a flag. Those women are accustomed to publicity, are conscious that their position permits unconventionality. It is when we see timid burgeois daughters, prim teachers, staid middleclass wives in the ranks that we think enfranchisement may be really at hand. ‘Club secretaries and leading literary lights walked in the procession,' said the 'Evening Standard’… and went on to wonder in somewhat 'servant gal' language 'how they could so 'demean' themselves. The first few minutes of procession walking are certainly a little trying. The present writer slipped in a little beyond Hyde Park, and for sixty seconds' after felt that the eyes of all London were upon her. Then the newcomer takes courage, raises the head, talks to her neighbor, and glances at the mottoes on the various pink and blue banners - the gentle 'For Hearth and Home,' the more warlike 'We Demand Our Rights,' the insistent 'We ask not Indirect but Direct Influence.' A little later one glances past the file of policemen walking beside us to the crowds that line the footpath. Remarks reach our ears as we step forward. It is difficult to gauge the London expression. There is generally the dawn of a grin; one sees only the dawn because by the time the smile is fullgrown we are level with the commencement of others further ahead. Sometimes when there is a stoppage, however, one will note a look of surprise as the masculine glance perceives so long a line of walkers - three thousand strong. Comments are frequent, and sometimes free. 'Go home and do housework' was a favourite admonition; it was heard first at Hyde Park, and met us again as we turned down Pall-Mall; later it cropped up once more by Trafalgar-square. 'What is England coming to?' was the disgusted observation of one 'Johnny,' who certainly gave the impression that England would not do much if it stopped at him. Well-known women come in for special comment. Miss Constance Smedley leans from her carriage to give an importunate beggar. 'Here, don't go wasting more of your dad's money,' called a loafer, in allusion to the princely Lyceum Club, organised by this little lady from her father's wealth. The policemen who walk beside us as guards do not know 'whether, to be proud' or ashamed of their position; nor are they quite certain how far to go in order to shield us from the impertinences of the onlookers. 'You musn't point at the ladies, but you can make remarks' is one constable's interpretation of his duties. So the rude; finger is put down, while the more or less rude tongue continues its criticisms. Nevertheless, the onlookers on the whole are not-inimical; here and there, indeed, is raised a cheer, and the words ‘Good luck to you, ladies,' hearten our spirits. As we pass Pall-Mall there is, I must admit, a little inward shamefacedness. These interested faces at the men's club windows are known to some of us; we have dined with this one, or gone to the theatre with that. We move on, however consoling ourselves with the reflection that we are braver than Cleopatra; she died rather than walk in a precession; we should die rather than not do so! The front page of the Daily Mirror after the protests of March 1907. So we get to Trafalgar-square at last, and Exeter-hall looms in sight; Boys are running about selling a Woman's paper. We are presented with pamphlets telling us to keep on our course; other pamphlets warning us of the horror in store tor us if we do. Portraits of leading suffragettes are handed about among the crowds, while the throng grows thicker, and the traffic ahead of us is stopped. 'Not often London has to give way to women,' says the processionists with glee; and then, guarded by policemen, we enter Exeter-hall, where Zangwill and Keir Hardie and other notabilities encourage us, while an overflow meeting finds inspiration at Nelson's statue. ‘In Holloway Gaol. 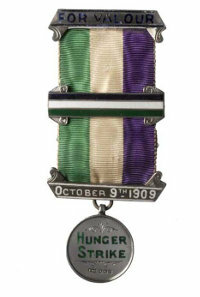 A Suffragette's Life. When I saw the startling notice "Fifty seven Suffragettes Arrested," writes Constance Clyde in the Sydney "Daily Telegraph," my resolve was taken to be one of the next batch who thus showed their desire for the franchise. Several motives influenced me; first, it was my only chance of getting into gaol respectably; secondly, I wished to show my admiration for those brave women who chose this method of warfare at a time when all England was against them. Nevertheless, I confess to a certain nervousness when I stood in Caxton-hall listening to Mrs. Despond (sister of Colonel French) inciting the women to attack the House of Commons. My nervousness increased when I followed close after Viscountess Barberton, as she swept out of the hall bearing the petition. It is difficult for an amateur to get arrested in the daytime, so, after sauntering round Westminster viewing the scene, I went back to Caxton-hall for tea and advice. Here I learned the right mode of procedure. The best way to get into the clutches of the law is to try and get another woman out of them. The experienced suffragette leads the way, pushing and remonstrating till seized; the "amateur" catches her arm, saying, "Let go my friend" (in reality they may never have met till that moment). Robert, exasperated, then takes her in tow also. A knot of policemen forthwith rush down to prevent an escape, and follow along till called to frustrate some other attempt to enter Parliament by another entrance. By obeying those directions I duly found myself, towards the dusk of that spring evening, in the desired grip of the law, and marched to the adjacent Police Court, was cheered by a cup of tea, and a yellow paper, which affirmed that Constance Clyde had behaved riotously and obstructed the police in the execution of their duty. In due time I appeared in court, pleaded guilty to having obstructed the police, and, having refused to pay the fine, was escorted upstairs and placed with my fellow-captives now behind a grating… About 5 p.m. we came down in batches of 12 or so to enter our respective Black Marias, on the steps of which we said good-bye to our friends in blue, and also to the crowd of small boys. Maria is not so black as she is painted, and the ride to Holloway was not the stuffy abomination I had expected. 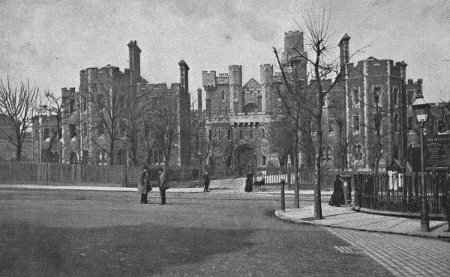 Unpleasant to the degree of misery, however, was our first evening in Holloway "Castle." During the night previous not one of us had slept, and one day in the court had been physically tiring. Now, from 6 till 9, we were locked up, three in each reception cell, with but one seat between us. Venturing to sit on the floor, we found grave objections to this proceeding, and, ringing for the wardress, produced the corpses of the slain. We were then removed into another cell, without any stool at all, and not daring to sit down on the floor, remained standing and walking for four hours longer. At last we were called out again to visit doctor, weighing machine, and bathroom, after which, clad in our loose prison clothes, we clumped in our heavy Holloway boots to a gallery, where each was locked into her cell. These compartments proved to be absolutely clean. Having ascertained this, I got down my legless plank bed, strewed mattress sheets, and blankets upon it, and heard the clock strike 2 as I went to sleep. At half-past 5 I was awakened by the rising bell sounding from far below. A Day's Food and Work. The first day in Holloway was most unpleasant; very few of us but complained afterwards of the harsh manners of the wardresses. Our advent, of course, throws much extra work on their shoulders, and as a result they would fling open our doors, shout something at us, and talk to us like naughty children because we did not understand. The day's procedure, once we knew it, was simple. At half-past 5 we rise, and, having washed in a tin basin, fold our bedding in a certain cart-wheel shape, and place it on the lower of two shelves. Then we attack the tin basin, dustpan, and jug with bathbrick and soap. This is the most unpleasant of our duties; we consider that, as we have not been sentenced to hard labour, our work should not be made difficult for us. Now, every housekeeper knows how much easier it is to keep clean enamelled ware than anything made of tin. At 7 we came out to fill our water-jugs, and, returning, place on the lodge tables near the door huge mugs, in which we receive in the morning nondescript tea, in the evening thin cocoa. Each time we receive also a roll of excellent wholemeal bread and butter; the latter, however, is an innovation, and was not enjoyed by the first batch of suffragettes. Locked in again, we sweep the concrete floor with a handleless broom, and, later, receive into our cells a pail, mop, and brush, with which, every morning, save Sunday, we wash the two shelves, the table ledge, the plank bed, the hot water pipe, and finally the concrete floor. This work, however, is light compared with the tin-ware cleaning. Chapel and exercise fill up the rest of the morning. At exercise we walk round and round the courtyard in single file, and all at equal distances. "Reverse," cries the wardress, and we walk round the other way. During this time we are not allowed to talk, but, needless to say, we drop a word occasionally, the strictness of prison rule relaxing as we get near the close of our stay. From half-past 11 till 12 we are locked in our cells once more, and at midday hear the clanking of tin cans, as some third-class misdemeanants (we belong to the first division), led by the wardress, come round with a waggon load of dinner tins. These hold potatoes with pea stew, boiled beef, pork, and beans, according to the day, and always a roll of brown bread. Save for an excursion to the gallery tap to wash our mugs, afternoon and evening are eventless. We sit in our cells, read, knit, or contemplate our surroundings. 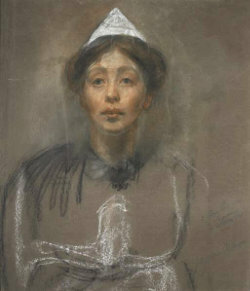 'Self Portrait in Prison Dress', Sylvia Pankhurst 1907. What do we suffer from most? It is not till the second week that the monotony preys on our spirits, and for most of us, the food being wholesome, is agreeable enough. We suffer much from physical weariness. In chapel we sit on benches without backs, and, unlike the London cab horses, cannot lean upon one another. In the cells we have no heat but a stool, and we are not permitted to lay out our plank beds till after 6. These beds again are as hard as the concrete floor. We have excellent electric light, however, and our cells are well heated, too much so for my taste. In fact, I should really suffer if I did not get up on my stool occasionally and breathe into the ventilator. Every afternoon as the clock strikes 3 I take my little constitutional to that ventilator, while viewing as much of the scenery as I can through the closed window. Till March 31 our electric light is turned on from 6 till about half-past 8; but from April 1 no light is allowed. It is now the summer season, even though the dusk begins before 7, leaving us several hours of idle wakefulness in our comfortless cells. Very dreary were these hours, and we can quite realise that prisoners spend them in devising new means of wickedness. Our chaplain has amused ns very much. He does not approve of the Suffragettes, and when a prisoner, asked her religion, pronounced herself a member of the Ethical Thought Society, answered abruptly, "Never heard of it." He has preached a sermon against us, counselling us to remember that a woman's best ornament is submission to authority. When he did this after a previous raid a suffragette was ill-advised enough to interrupt him. This, as a wardress explained to me, was very foolish, as it might have led the ordinary criminal women to revolt, and then "we should all for a time have been at their mercy.” We have the laugh at the chaplain, however, for did he not tell us of certain Biblical character that she was a "free agent," "as free as any of you, sisters!" At Easter time we have another chaplain, and he, quite accidentally, I believe, gives a stirring sermon on the necessity of fighting and striving, and disregarding the comments of the world. To which preacher shall we suffragists lend an ear?